CARDIFF PHILHARMONIC ORCHESTRA WANTS YOUR TALES OF ROMANCE! LOOKING for the perfect way to spend Valentine’s Day with your partner? 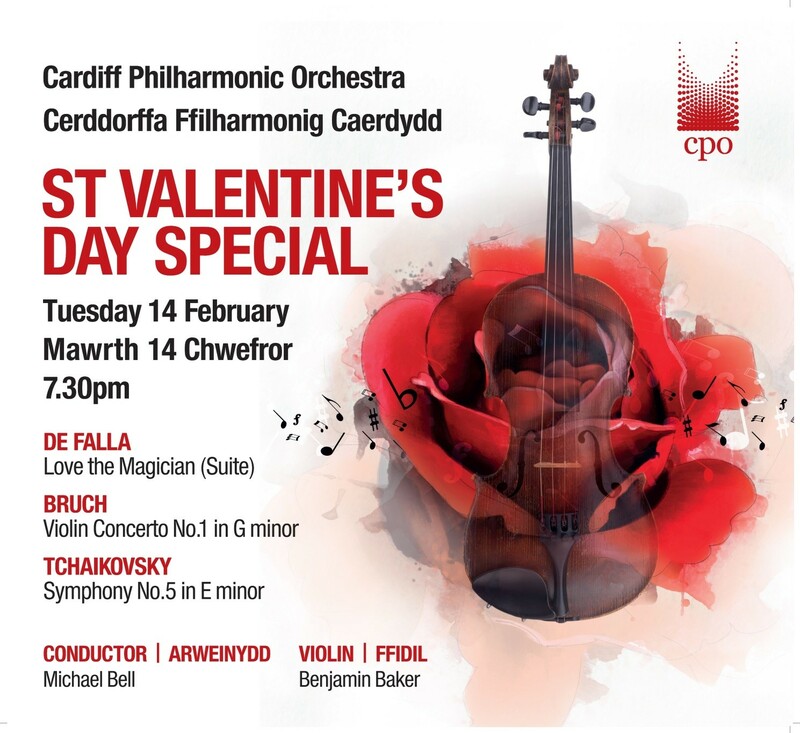 Well, look no further than Cardiff Philharmonic Orchestra’s St Valentine’s Day Special concert at St David’s Hall on Tuesday 14 February featuring some of the most romantic music ever composed! And to get you in the mood, we have three great competitions lined up. Full details of how to enter are below, and the meals can be arranged at your convenience. Please note that the winning entries will be chosen and read out by Conductor Michael Bell at the Valentine’s concert. Firstly, anyone who buys a ticket for the concert will be automatically entered into a prize draw to win a £50 meal voucher for two at Miller & Carter Steakhouse just around the corner from St David’s Hall. Secondly, to win a £50 voucher to the Côte Brasserie French restaurant on Mill Lane, please tell us briefly why your partner deserves a romantic meal for two. Perhaps it’s the way he treats you like a King or Queen? Maybe it’s how good he or she is with the kids? Or perhaps it’s the little things he or she does on a daily basis without ever needing, asking, or expecting any thanks? Thirdly, to win a £50 voucher to the Madeira Portuguese restaurant just off Churchill Way, please tell us about your most memorable first date. This could be the man or woman of your dreams who you ended up marrying? Maybe something embarrassing happened or you ended up with food poisoning? Perhaps it was love at first sight, or maybe you hated each other as soon as you set eyes on each other?! Entries can be as romantic or as light-hearted as you like, but keep it clean ladies and gents! We are thinking a subtle Mills & Boon rather than Fifty Shades of Grey! Cardiff Philharmonic Orchestra’s programme opens with Manuel de Falla’s sultry and sensuous music from his ballet Love the Magician, the most famous section of which is the exciting Ritual Fire Dance. Max Bruch’s Violin Concerto No. 1 is perhaps the most beloved of all violin concertos with a deeply soulful slow movement at its heart. Sharing the stage is the brilliant young violinist Benjamin Baker, who has previously performed concertos with great panache by Brahms and Tchaikovsky with the orchestra. Benjamin recently fended off competition from over 160 applicants from 20 countries to win First Prize at the Young Concert Artists Auditions at Merkin Concert Hall in New York. The captivating concert closes with one of the greatest of all romantic symphonies, Tchaikovsky’s Symphony No. 5, which has been loved by audiences ever since its premiere in 1888. This heartfelt and emotional work is dominated by fate, which triumphs over all. In person, please drop your entry into the red CPO Valentine’s Day box located on the St David’s Hall Box Office counter, or please hand to a member of staff. Blank entry forms are also available on the Box Office counter.